Republican candidate for the U.S. presidency Herman Cain voiced his opposition to the construction of a new mosque in Murfreesburo, Tenn., recently. If it were a mere voiced opposition to the construction of this particular mosque, that would, in itself, be only a relatively minor cause for concern. But he didn’t stop there. Mr. Cain is, in a word, wrong. And, really, if he were only a fringe candidate with a minor chance of winning the nomination, it wouldn’t really matter. That, unfortunately, isn’t the case. While the chances of him actually becoming the Republican nominee and defeating Barack Obama in an open election are, in my opinion, microscopic, it can’t be entirely ruled out this early in the election cycle. 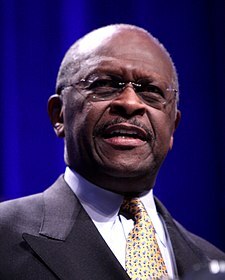 So, let’s pick apart Mr. Cain’s idiotic statements, shall we? In spite of the terminology he used, Americans do not have a “right” to ban members of a particular faith from building a place of worship in their communities. That’s cold, hard fact. No American has any right to restrict the religious freedom of any other American, regardless of the person’s faith. I haven’t taken the time to peruse the blogosphere in preparation for this post, but I can only imagine that there are many Christians who are willing to jump on board with Mr. Cain. They do so at their own peril. Christians should be at the forefront of opposition to any attempt to limit religious freedom or restrict religious worship. Laws which are already being enacted in Europe–such as the ban on burqas in France and the ban on the construction of minarets in Switzerland–should be source of concern for anyone who wishes to see the protection of the freedom of religion continue. 1. To the Christians who would support Cain, you need to realize that the government of this nation is not and was never intended to be an extension of the Church or of one particular faith. Your support of these kinds of positions indicates to me you believe, consciously or otherwise, the opposite to be true. America is not a Christian nation, so please stop making the absurd assertion that it is. America is a country where people were intended to be able to worship the God of their choosing, an ideal for which we should be the most vocal proponents. 2. To Herman Cain (and anyone else running for president), the president of the United States is not required to leave his faith on the doorstep of the White House. That said, he is tasked with being the president of the whole country and all the people within it. A continuing source of irritation for me is the speed with which religious conservatives have flocked to Texas governor Rick Perry, apparently, it seems, because he called for a statewide day of prayer and fasting for rain. While that is to be commended, the president is not pastor-in-chief and if that is the only (or biggest) reason he enjoys the support of so many Christians, then God help us all.